Weather: Upper 30's to start, mid 50's at finish. Negligible wind. 3 8:26 Another mile right on target. 5 8:37 Would've been on target, but had to stop for water. 6 8:30 Nailing my pace, but starting to feel it a bit. 8 8:52 Hard to breath. 10 8:56 Hanging in there. 13.1 0:42 Wiped out, but finished okay. Okay, let's face it. I have a racing problem now. 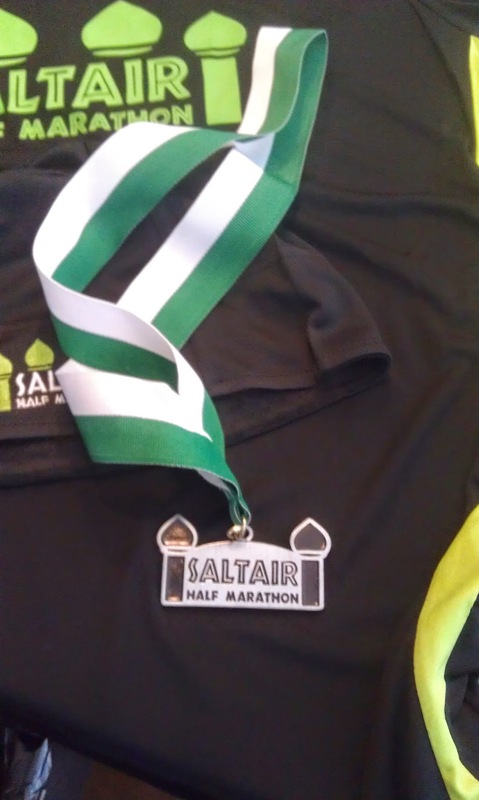 Normally I don't race a half marathon one week before a marathon. Usually this is the taper week where you do an easy 8 mile run. But I've been breaking all the rules and while I can't claim success or that it is working, I am having fun. 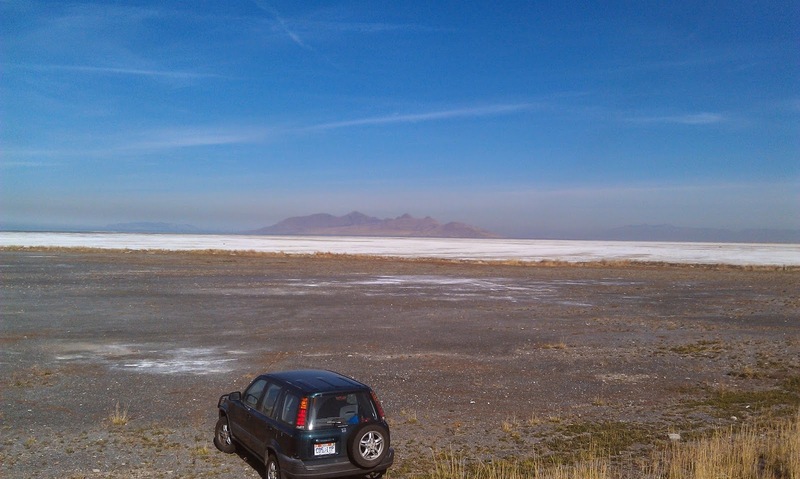 So that is why I signed up for the Saltair Half Marathon. 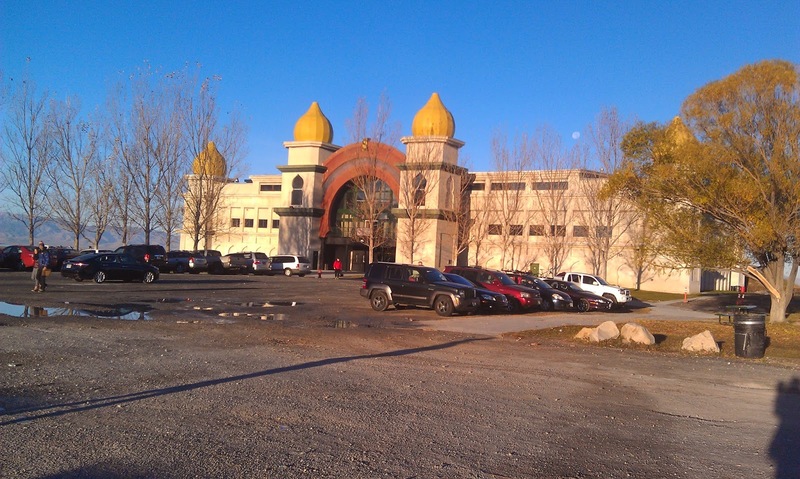 The race starts at the Salt Aire Pavilion - a concert hall on the far west side of town. 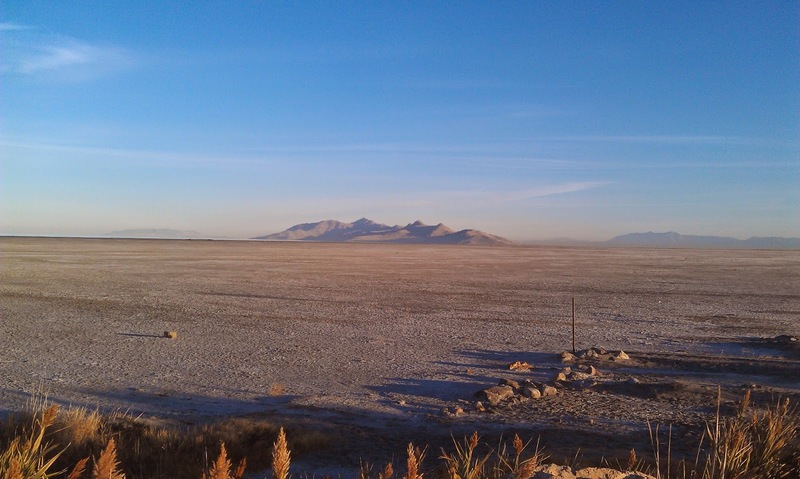 On the way to Wendover, we always pass that place and I've always wanted to run the frontage road. It is not uncommon to see cyclists along the road, but very few runners. 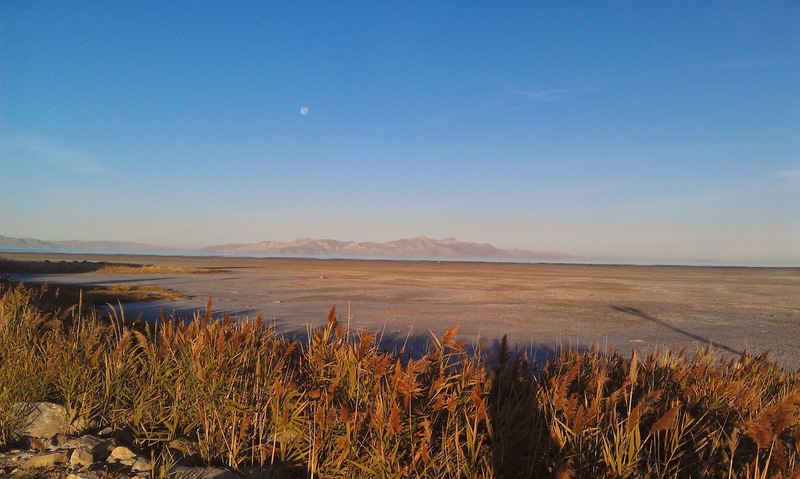 With the Saltair Half Marathon running along the road, I could get in a quality run as well as satisfy my curiosity. The course is pancake flat out and back course. 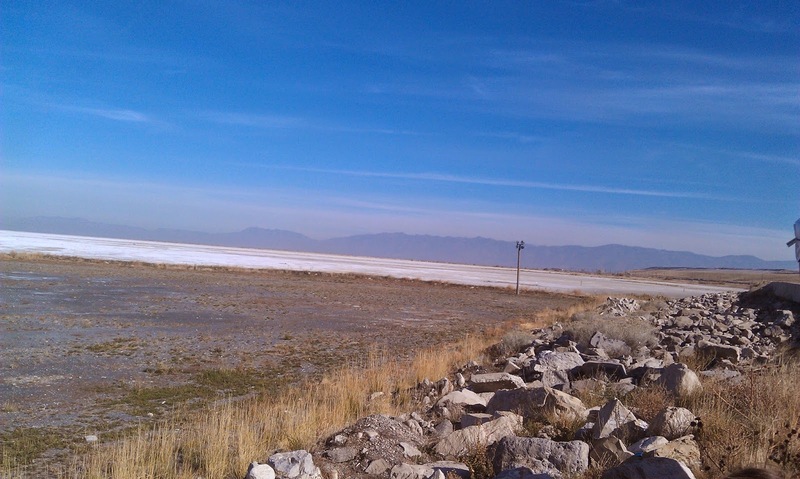 While the scenery might appeal to those who are new to Salt Lake, I've seen the Great Salt Lake and novelty sort of had worn off. The scenery doesn't change much throughout the race. On your right, is the freeway with the occasional truck or car honking in support and on the left a vast wasteland of scrub, sand and dirt. Today the breeze appeared to be blowing east to west so the stink of the lake wasn't on us. Also the lake's water was quite a ways back due to the late season (it gets more full in winter and spring). 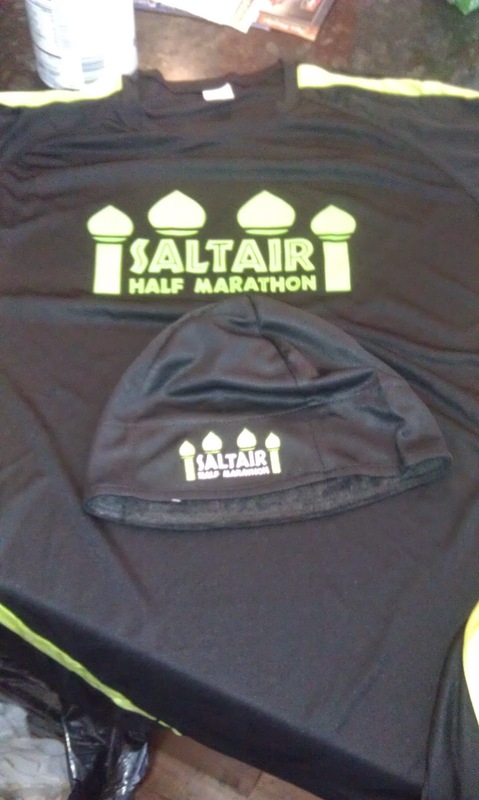 The cost of the race was $65 (including service charges) and if you brought a donation of used clothes you got a skull cap hat (pretty nice). You could also pony up $10 for a t-shirt. While I don't need a t-shirt, I am a sucker for memorabilia and figured why not. I rolled in early, got to use clean bathrooms in the concert hall and picked up my swag without any problems. I wound up loafing in my car for about 45 minutes (I arrived pretty early) and the race started at 8:45 without any complications. I had another calf strain issue on Thursday. I was doing strides and all of the sudden my left calf lit up in pain and I was concerned about it. I wound up walking home that day so I was wondering how it would hold up in this race. Had I not registered for the race on Wednesday I probably would've skipped this one. However, let's face it, if I can't do a half marathon, I can't do a full in Vegas next weekend. So I used some KT-Tape to secure the area and hit it hard with some NSAIDs. I am happy to report I had ZERO problems with it. Whew. My goal was to run 8:30's - 8:45's for as long as I could. Looks like I lasted about 8 miles, which is actually pretty good. The air felt REALLY thin today and for some reason it was hard to breath. 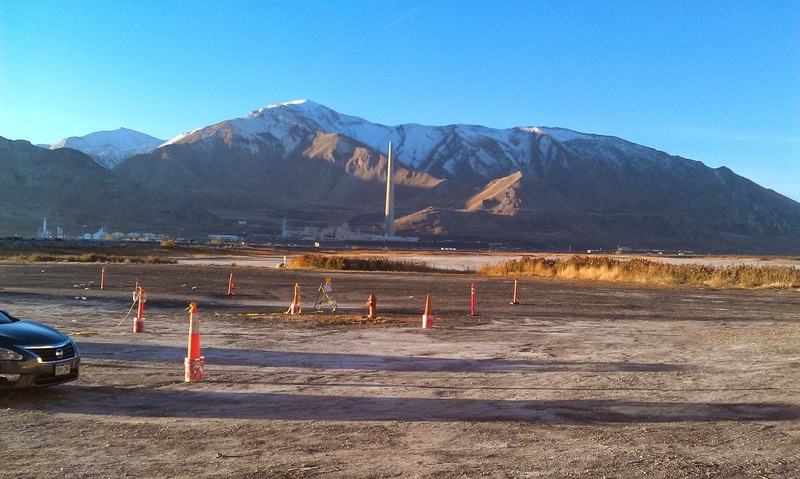 The race was 100% on a frontage road (closed to traffic) along I-80. It was flat and you could see the route for miles (sort of disheartening to see the finish line 2 miles ahead and not feel like you are making progress). While the highway next to you has some rolling hills, the route we took didn't have any hills whatsoever. One thing I didn't know was that this was a cupless race. Meaning if you want something to drink, you carry it. Oops. I didn't read the fine print on the race site. If you were willing to stop, they'd either pour water in your hands or you could get under a spout and drink it straight from the tap. I wound up doing that about 3 times. I was shocked when I went through the first water station to see volunteers only handing out gels (which they were eager to give out). My guess as to the reason why they did this is that the area where we were running is a state park and the race people would probably be fined if there were cups blowing around. So I understood the requirement, but I wish they had spelled that out a lot more clearly. Usually each water stop required a good 15 - 25 seconds to get a good swig of water, so I definitely lost precious time there. About mile 9 or so I did see that one water station had plastic bottles of water but they weren't really being offered. About .15 miles down the road I spied a bunch of them in the weeds, half full. Shamelessly I scooped one up, dumped most of it over my head and took a pull or two. I know gross, but it helped immensely. Just hope I don't get sick. 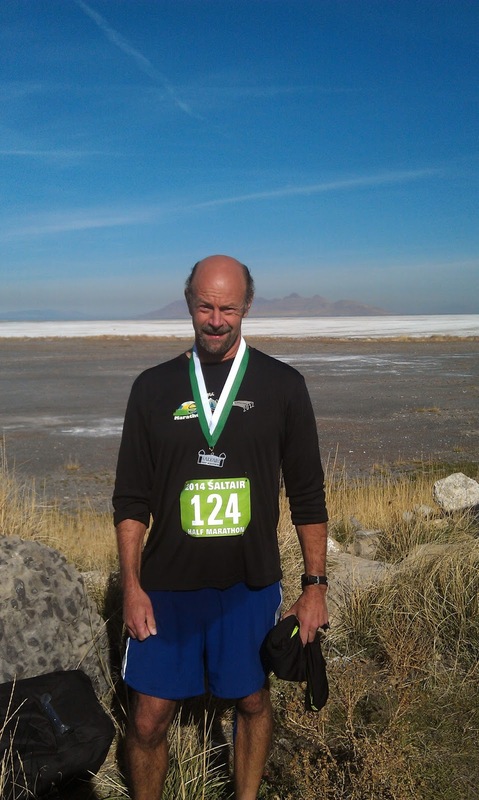 I had a mild stomach ache throughout most of the race -- which I am not sure why as it cleared up after the race. Nerves? Anxiety? I don't know, but it made it hard to run. The scenery was pretty but it got old fast. There wasn't any shade and there wasn't much to get you really excited about where you were running. Because the route was closed and there isn't anyone living out there, there was no crowd support except the volunteers at the aid stations. I did enjoy the solitude and there were plenty of people to work off of however. There were a LOT of fast runners for this race as they had nice cash prizes for top finishers. Maybe in my heyday I could've pulled a top 20 on this race, but no more. After finishing the race, I grabbed some water and a pair of Diet Dr Peppers. Man did they taste good. They were begging people to take post race food so I grabbed a banana and a pair of Fat Boy Ice Cream Sandwiches. If you haven't had a chance to try a Fat Boy, I really recommend it. They taste fantastic post run. I wound up loitering around, chatting with various people and soaking up the awesome fall weather we've been having. Given my current racing, my time is about where I expected it would be. I might've been a bit better had I been a well rested and didn't have a stomach ache. 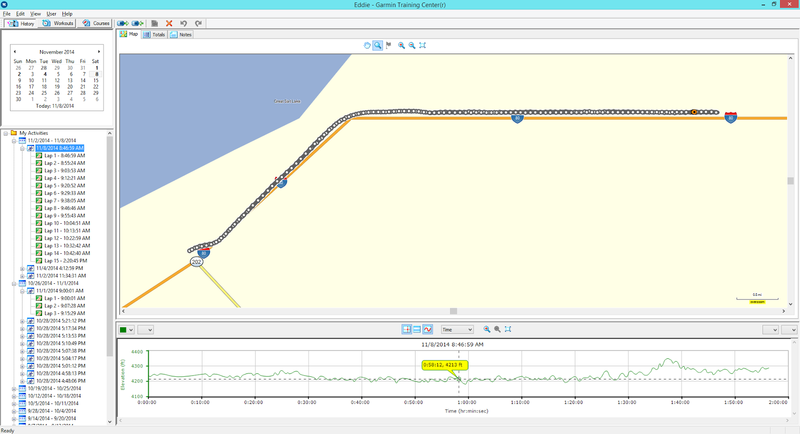 But I am glad to stay under 2 hours and it does give me a baseline to go off of for the marathon. Most of all, I am glad my calf didn't go nuts on me. I think a lot of people are starting to recognize me now from the races. I am not sure if there is another guy that looks like me, but I got a lot of "Hey how are you doing" from a lot of different people. Kind of cool that maybe I am getting ingratiated into the local running scene. Not sure I'd do this race again. 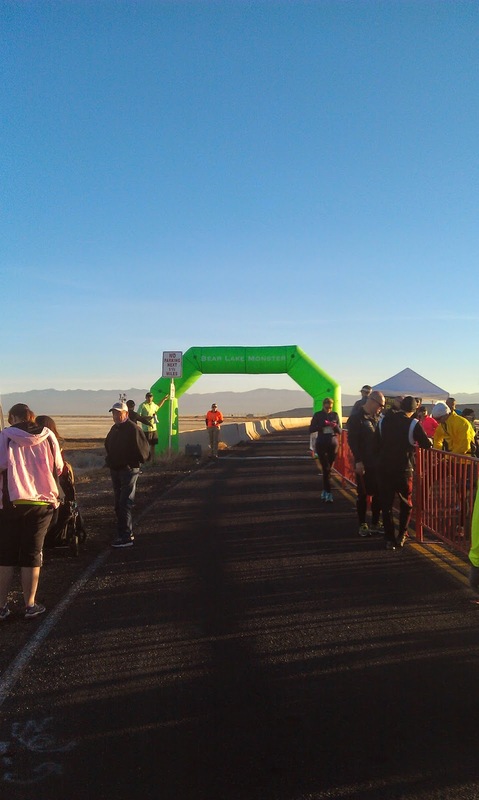 I've satiated my curiosity about the frontage road and this race is so close to my annual pilgrimage to Vegas, so it doesn't really fit well into my training plans. It would've been a lot more affordable too had I registered for it early.